Simple, Cute Craft Idea for Easter Basket or Decoration! We see many craft ideas using clay flowerpots all over the web. But, we were drawn to this idea for its simplicity and ease. 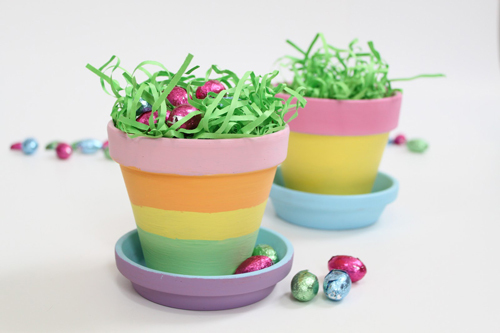 We thought these clay pots would not only make a cheery Easter decoration but how about a homemade Easter Basket for young or old. Start with our Italian Terracotta Flower Pots which are the most compact, smooth clay being manufactured today. Purchase some pastel acrylic paint and paint the pots in a rainbow, solid or anyway you choose to decorate them. Fill with shredded colorful paper available from most craft stores and fill with Easter goodies or treat. How much more simple does it get and look how cute it turns out. Have them hide around your home for the kids to find Easter morning, give to a office coworker or friendly neighbor. Include a seed packet so they can use the decorated clay pot to grow a plant with Spring right around the corner. We also like the idea of having one already painted, then setting up a craft table for the grandkids on Easter morning while the adults prepare Easter Supper. So many fun ideas from a few clay pots and paint. Have fun!